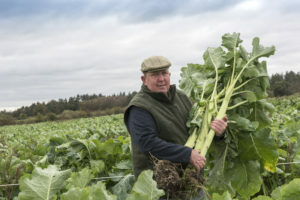 Kevin Robinson will be growing kale again in 2019 – and he will opt again, after the success in 2018, for a new variety with more digestible stems than previous kale varieties. Enticed by Adam Simper at Wynnstay, Kevin, who manages the farm for Marigold de Quincey, drilled 2ha of the new kale variety Bombardier in mid May 2018 and started strip grazing the field in late October. The cows were back-fenced so they could run back on to the grass. They also had access to straw and feed blocks as part of their diet. “It provided valuable extra winter forage. 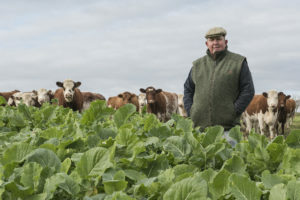 We overwinter the cattle outdoors – they only come in to calve, so producing as much home-grown forage – of good feed quality – is important to us,” adds Kevin,” who runs the mainly Hereford cross cows on his mixed arable, beef and sheep unit at Upton Magna, Shrewsbury. The kale seed was drilled on a rough piece of ground that had been badly rutted following a wet winter. The land was disced and then power harrowed and Kevin sowed the seed from a spinner off his quad bike. An extended summer and warm autumn held temperatures above the seasonal norm and the kale kept growing. Even when the cows moved onto the crop in late October it was still growing. Kevin plans to follow the kale with a grass reseed and, impressed with the robustness of the crop, he’s growing more Bombardier kale on another field ready for winter grazing in 2019. Poor stem quality – that may have been 60% to 70% of the total yield, has often limited the feed value of forage kales but new varieties, that have softer and more digestible stems, have improved the feed value and utilisation of the crop. Trials have shown that this new variety has a digestibility of 72.2% and a dry matter content of 13.5%, with a relative dry matter yield of 18% above the control variety, that’s 1.74 tonnes more from each hectare. It is expected to produce between 70 tonnes to 80 tonnes of fresh yield per hectare and between nine and 11 tonnes per hectare of dry matter. 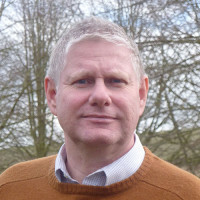 “In the past, farmers have faced a bit of a dilemma when it comes to kale,” adds Mr Titley. “If the kale crop is grazed well, then crop utilisation is good but the poor feed value in the stem will limit liveweight gain. A less well-grazed crop, where a proportion of the stem is left, will achieve better liveweight gains but poorer crop utilisation. Kale is best drilled in May or early June at a seed rate of 5kg per hectare. Farmers are encouraged to opt for varieties that are club root tolerant and where the seed can be supplied with a fungicide seed treatment.